This building is situated in what must be one of the most uninspiring and 'placeless' contexts with which any architect could be confronted. It is located on the west-facing edge of what is called an 'office park'. However, this is unfortunately a place with very few park-like characteristics, and is across the road from the gigantic Gallagher Estate Convention Centre. The 'black box' nature of the convention centre means that it is inwardly focused, leaving large blank facades to the street. Many other buildings within this car-dominated environment are of a similar nature. For the odd pedestrian, it is a hostile environment to navigate with no real social life on the street. Into this difficult context the architects have been tasked with inserting premises for the Foghound Interactive Coffee Company, using disused shipping containers. These containers, as we all know, were manufactured for a different purpose. Unequal world trade and obsolescence have meant that thousands of these structures have been left lying around, with no purpose, worldwide. Many architects have been tempted to make use of them, though few have been successful in truly converting the structures for human habitation. Traditionally, shipping containers have had one purpose only. Their shape, dimensions, structure and structural characteristics can, in the wrong hands, create more problems than they solve. In this problematic situation, the differently purposed containers, with their associations of temporality and connections to an international world far beyond the local, seem to conspire to wreck any possibility of local place-making as well as of meaningful human habitation. However, the architects of the Foghound Interactive Coffee Company have confidently overcome all these potential problems.They started by arranging the container building in an L-shape and have placed it on the street edge, on what must previously have been a parking space. In turn, the L-shape creates a courtyard-like space between it and the office buildings. By means of a deck on the west side, an interactive social space has also been created quite cleverly on the street edge. The structural and spatial limitations of the containers have been overcome with much ingenuity. The architects have also managed to inspire a beautifully crafted and conceptualised interaction between the levels - i.e. the coffee shop below and the offices above. The inherent nature and history of the individual containers has been retained, while the possibility of temporary use by humans has been achieved through careful attention to detail. Furthermore, the cobblestones in the courtyard space manage to evoke the idea of permanence, while the west-facing deck on the street facilitates a degree of social interaction between the coffee shop and the street even though this is an unlikely space for it. 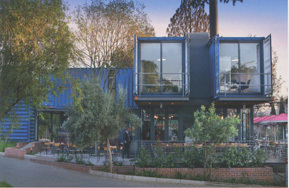 This container building is proof that an architect and a supportive client can, despite many obstacles, create a place of human dignity and delight; even an environment with the ability to create memory and place. However, in the hands of a lesser-gifted and inspired team, the same elements may well have combined to create something about which few would have had any enthusiasm.